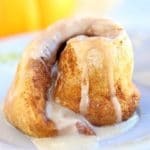 Yeast-free, lower sugar pumpkin spice cinnamon rolls that are both figure-friendly and easy to make! How ’bout some pumpkin spice to kick off October? 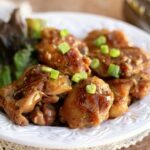 Hubsy has officially declared these ‘his favorite treat ever’! I think he may have forgotten about this one, but I won’t fault him. These are pretty good, if I do say so myself. 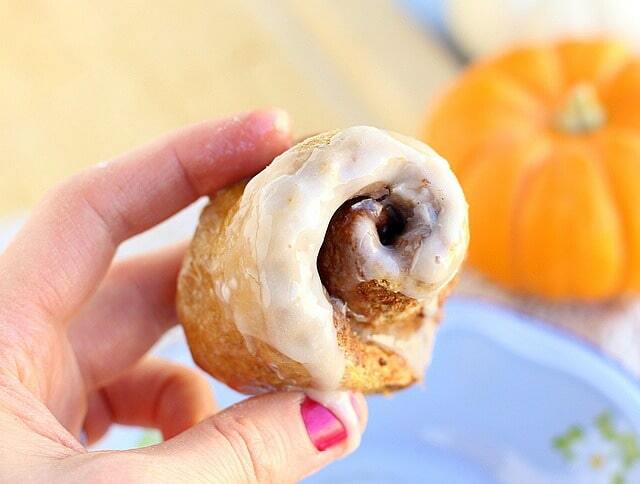 The reference point you have for cinnamon rolls might be a tad different from what I’ve created here. The actual bread part of the roll is totally sugarless. 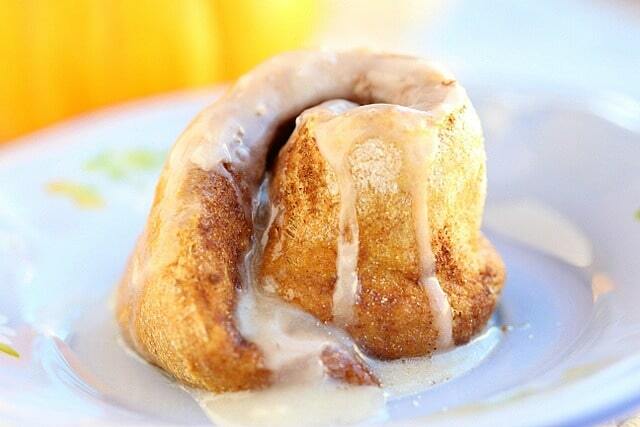 The sweetness comes from the cinnamon/pumpkin spice/sugar combo that gets sprinkled on the inside. With desserts that are layered, like this one, I find that I only need one component to be sweetened in order to satisfy me. It’s a little trick I use to keep my sweet tooth in check! If you want to bump up the decadence, however, try topping these with a powdered sugar glaze. That’s how my husband enjoys them! I like them with coconut butter/milk ‘icing’, which I make by stirring together a 1 to 2 ratio of the two ingredients. Sometimes, I’ll add in a pinch of vanilla powder and/or 1/2 teaspoon of maple syrup. I even think my Peanut Butter Frosting would be a great complement, but I put that stuff on everything, lol. 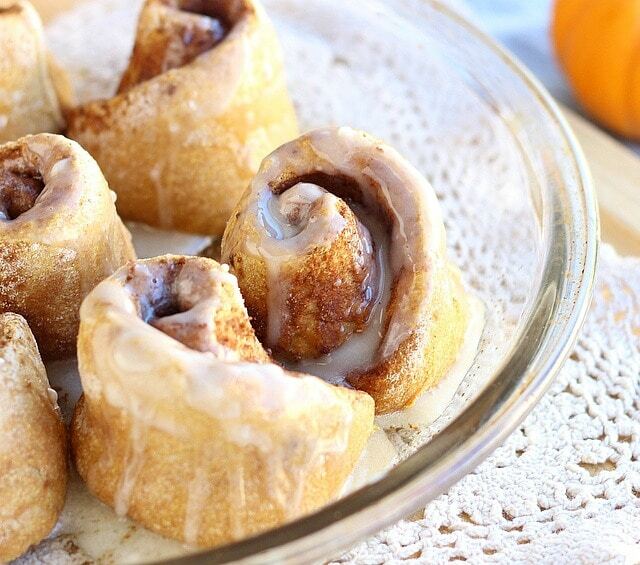 However you make them, I hope you enjoy these yeast-free pumpkin spice cinnamon rolls! 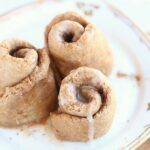 Yeast-free, lower sugar, and whole grain rolls that would make a legit healthy breakfast! In a bowl, mix the flour, baking powder, and salt. Cut in the pumpkin so that the mixture looks 'pebbly'. Stir in five tablespoons of milk, vanilla, and vinegar, adding extra milk if needed. The ingredients should all be moistened, but NOT sticky. If it happens to get too sticky, just add a bit more flour. Knead the dough a bit until it is smooth. Form a ball and cover the dough with a bowl for five minutes. 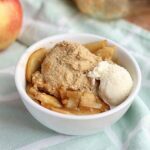 In the meantime, stir together the sugar, cinnamon, and pumpkin spice in a small bowl. After the dough has rested, divide it into four equal pieces. Roll out each piece into an oval shape. It should be about 1/8-1/4 inch thick. Spread each piece with 1/2 teaspoon of butter or coconut oil. Sprinkle the cinnamon sugar mixture equally onto each piece (you can save a bit for the tops). 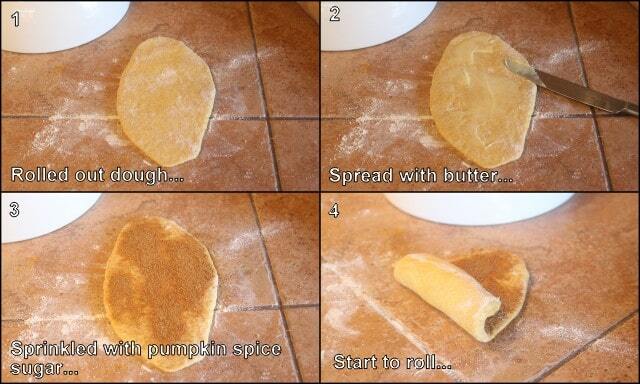 Carefully roll the dough, jelly roll style. 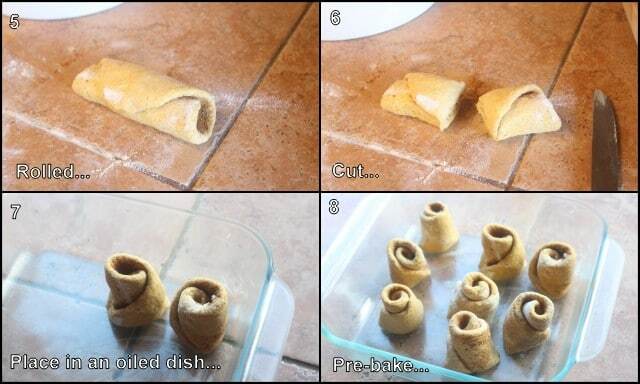 Cut each roll in half. 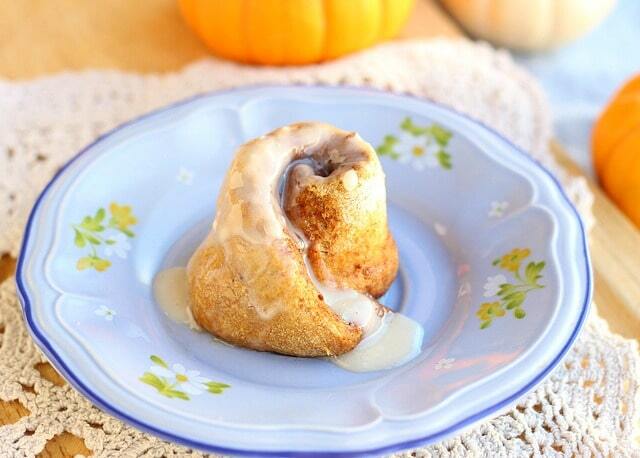 Place the rolls into an 8 x 8-inch oiled baking dish or pie plate (sprinkle with any remaining cinnamon sugar). Bake for 12-16 minutes until cooked through. 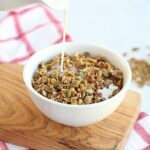 Would this work with oatmeal flour? I am gluten free…. Do you think this would work with a gluten free flour blend? Seems like it might. 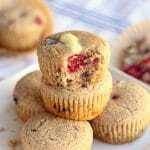 I’ve seen other recipes swap out GF flour easily. If you try it, I’d love to know how they come out!